Captain Radhika Menon broke barriers by becoming the first woman captain in the Indian Merchant Navy. 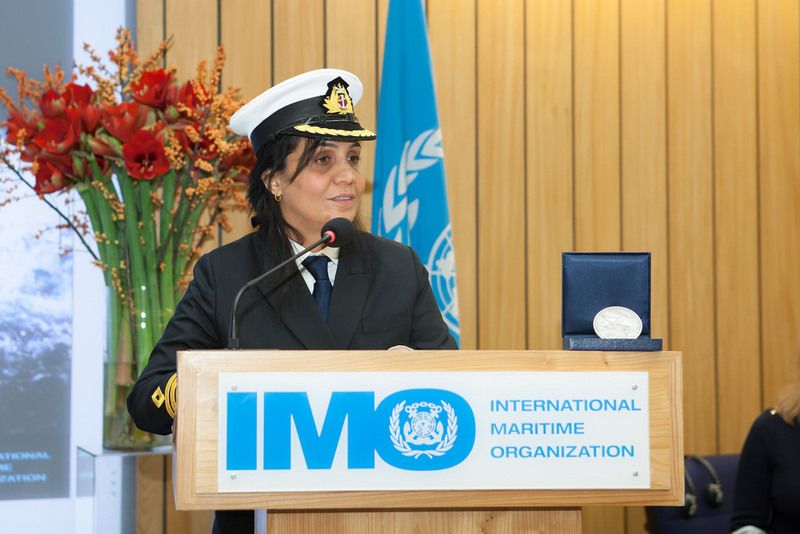 She will now also be the first woman captain to receive the IMO Award for Exceptional Bravery at Sea, which provides international recognition for those who, at the risk of losing their own life, perform acts of exceptional bravery, displaying outstanding courage in attempting to save life at sea or in attempting to prevent or mitigate damage to the marine environment. Captain Radhika Menon received this recognition for her role in the dramatic rescue of seven fishermen from a sinking fishing boat in tumultuous seas in the Bay of Bengal. Seven fishermen were left adrift following engine failure and the loss of its anchor in severe weather. Food and water had been washed away and they were surviving on ice from the cold storage. Through wave heights of more than 25 feet, winds of more than 60 knots and heavy rain Captain Menon ordered a rescue operation, utilizing the pilot ladder and with life jackets and buoys on standby. It took three arduous attempts in the lashing wind and rain and heavy swells before all seven weak and starving fishermen, aged from 15 to 50 years old, were brought to safety on board the ship.